Debbie from Dog's Hope sent this to me through e-mail to post. BLIND GIRL IS BEGGING FOR HER LIFE!! The warden is begging for help. She said this dog is super friendly and sweet. They would like for this girl to get another chance. This is a female. 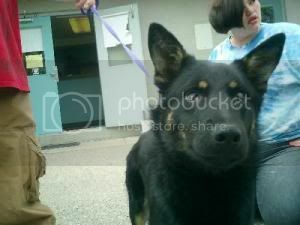 She is black and tan with short hair, and is a medium to large size. She appears to be blind in both eyes. She is very sweet and loving. I hope this poor baby gets another change. Bump--This dog deserves both a name and a loving home. I hear blind dogs are the best! How much time does this girl have? I can donate to an approved rescue to help with her expenses. Please send me a PM if help is needed. Last Hope has asked for more information on this girl and we are waiting for a reply. We have a possible sanctuary that would take her and then network her to a forever home.